My sister and I occasionally travel together, and while we’re alike in many ways, our idea of the perfect accommodations differs wildly. She’s all about the social aspect of things—meeting new people, watching kids frolic in the pool, and taking part in activities that include others. I’m all about being left alone to read a book on the beach, sip on a cocktail and enjoy some serious down time. We recently traveled together to Puerto Vallarta, Mexico, and it made me realize just how much finding the right place to stay can affect how you enjoy a vacation. You’d think that a four-star hotel is a four-star hotel, right? Wrong. Every property is different, and it’s worth it to take a little more time to find one that reflects your personal tastes, whether that’s a restive, all-inclusive, adults-only premier resort, or a family-friendly, activity-laden hotel that’s a lot livelier. The Villa Premiere Boutique Hotel and Romantic Getaway, for example, was my cup of tea—or actually my glass of champagne, since that’s what was given to me upon entering the premises. This was accompanied by a damp towel to clean off the travel dust, followed by a soothing 10-minute shoulder rub in the massage space beside the check-in area. An adults-only getaway, the resort prides itself on pampering its guests, providing everything from aromatherapy in the rooms to a pillow menu designed to make sure you rest easy, which is a cinch to do in such a quiet, luxurious space. Two pools, including a swim-up bar, provided the perfect place to relax and read a book, and the super-attentive staff caters to guests’ every need. 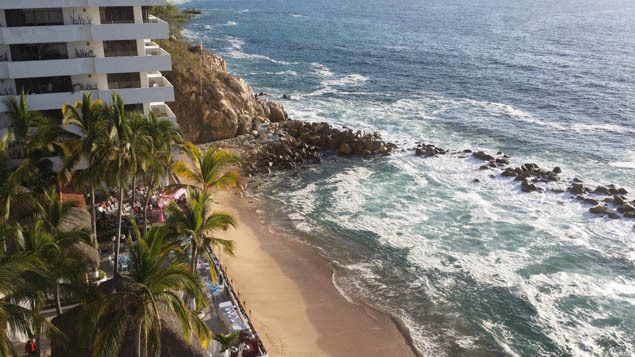 Costa Sur, on the south shore of Puerto Vallarta, is a family-friendly resort, and had a completely different energy than the laid-back elegance of Villa Premiere. From the time we walked in, we were surrounded by happy families enjoying their holidays, especially at the large pool where children were boisterously showing off their swimming skills. The resort offers a lot of family activities including crafts and games, and there was always something going on, which was the perfect setting for my vivacious sister—it didn’t take long before she was chatting with other guests by the family pool, while I enjoyed a quieter experience (okay, a nap) at the adults-only pool. While we both greatly enjoyed each property, there’s no doubt that had we been vacationing alone, I would have chosen Villa Premiere and my sister would have chosen Costa Sur. The amenities at both were top-notch, but it really just comes down to personal preference and how you like to travel. I recommend making a list of what’s important to you before you start looking for a space. Of course location and price are going to be important, but also think about how you want to feel when you’re there—rested or invigorated? Some other questions to think about: Do you prefer the company of other adults, or do you enjoy the energy that kids bring? Do you want a la carte dining or full, sit-down meals? Do you prefer a quiet, sandy beach or waves crashing over a breakwater? Do you turn in early, or need some kind of nightlife? So you want to be near to town, or get away from it all? While most people spend a lot of time deciding where to go when traveling, they often don’t consider how the accommodations can affect their overall experience. Take a little time to define the type of atmosphere you want, and then find a place that provides it. How do you decide where to stay while on vacation? Let us know on Facebook.